In Linköping, the largest part of the district cooling is produced from district heating through absorption cooling, a well-proven technique with water for refrigerant and lithium bromide as an absorbent. The absorption process is based on the same principle as all cooling processes, that is, the refrigerant is brought to evaporate at low temperatures by maintaining a low pressure. 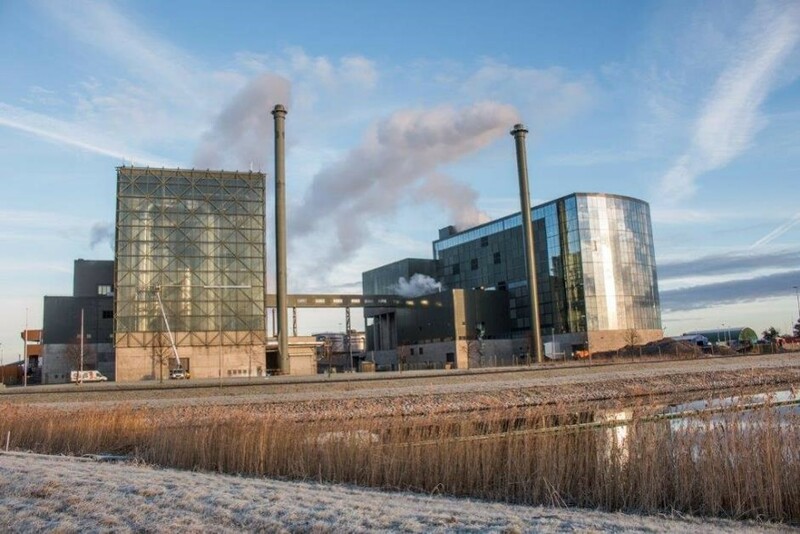 The cooling is produced from waste heat in the Waste-to-Energy plant (picture) and distributed as cold water via pipeline to the customer’s premises. In this way, the use of hydrofluorocarbons (HFCs) for cooling is eliminated. HFC gases are thousands of times more destructive to the climate than carbon dioxide, and scientists say their growing use threatens to undermine the Paris accord, agreed last year by 195 countries. In 2016 the UN added the Kigali amendment to the Montreal protocol which determines the schedule of the coming HFC phase-out. In this context the use of HFC free absorption cooling is a strong option. Price for district cooling: 50 €/MWh. For the customer, district cooling is a simple, efficient and trouble free solution to the cooling problem. Since the cooling process is absorption based, all emissions of GHG that is a consequence in regular cooling are avoided. Absorption cooling increases the profitability of the electricity production from WtE CHP plants by providing use for the heat remaining after the steam turbine. The alternative to providing cooling which is sold as a product would be to cool off the excess heat in a power and water consuming cooler. District cooling is capital intensive. Start up of a new net is a quite large investment. Relatively complex process involving many parties when cooling pipes are to be installed and existing cooling systems in buildings are to be replaced. District cooling operates in a more narrow temperature range compared to district heating. This limits the range of the system. HFC free district cooling is most efficient use of heat from WtE. Any obstacle for this treatment method will be an obstacle also for absorption cooling.